Anthony Watts is irate that Gavin Schmidt didn't call out a climate science denier! This is rich. A climate science denier on Twitter wrote a sarcastic tweet, and Anthony Watts is irate. No he's not irate that the denier was sarcastic. What he's irate about is that Gavin Schmidt, the Director of GISS at NASA didn't call it out. No reasonable person reading that tweet would take it at face value. It dings all sorts of alarm bells. Then again, whoever accused a "climate hoax" conspiracy theorist like Anthony Watts of being "reasonable"? Wow, this is really something. Three days after a declaration about “faking climate science” to be “more emphatic” Not a peep from NASA GISS head Gavin Schmidt. That’s a troubling omission of condemnation, especially since both sides of the climate debate should be condemning this. Science is no place for “faking graphs”. Period. I’ve said before (after the OIG report slammed them) that NASA GISS is wasteful and redundant, and should be closed. Now it appears they may be under mendacious leadership as well. Apart from his dumb claim that there are "sides" of a "climate debate" (trying to assert climate "hoax" conspiracies are somehow legitimate), Anthony is now blowing out of all proportion the fact that the head of a climate agency didn't bother responding to a dumb tweet from a denier - one of Anthony's own kind. There are any number of reasons why Gavin Schmidt may not have replied to the silly tweet from @o_glyndwr1404. Here are some of them, you can add other reasons in the comments. Dr Schmidt may have blocked or muted the account and not seen the tweet. He may have thought that calling out every denier on Twitter would take up too much of his time. He may figure that replying to a denier (especially one with only 90 followers) is not worth his energy. Warmists get paid far more to hold their views. Global warming is a $1.5 trillion ANNUAL industry. All the people on that payroll have a vested interest in keeping dullards like you believing in the scam. If space is the best way to do it, then I have some great news for you: nasa have been caught out faking data to support climate change which is clearly NOT happening. So that means we have nothing to worry about. They faked the data to keep that $2bn rolling in. If the "science" you're looking for is "climate change", then it is filed under "fiction". So Anthony Watts was up in arms that Gavin Schmidt didn't chastise a science denier for making a sarcastic tweet. That's a turn-up for the books! 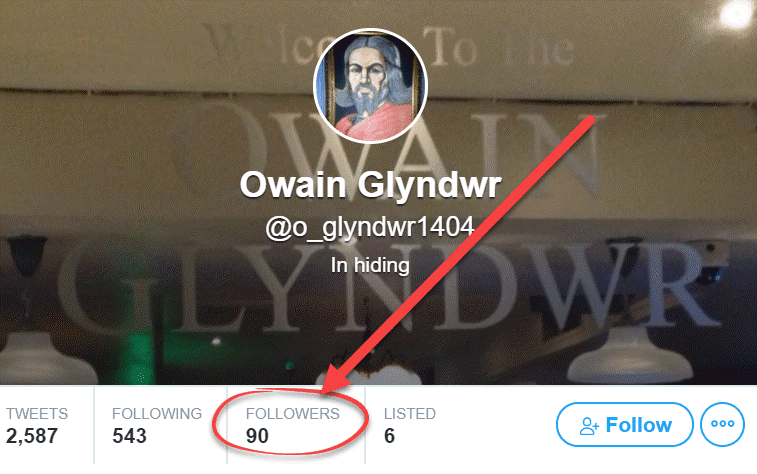 The reaction to Anthony's explosion of indignation wasn't overwhelmingly supportive, although hardly anyone figured out that Owain Glyndwr @o_glyndwr1404 is a climate denier. Joel Snider didn't investigate, but took Anthony Watts and "Owain Glyndŵr" at face value. Except that wasn’t a troll, was it? That was a like mind, impatient with us skeptics. Schmidt doesn’t want to discourage THAT. Just like Mosher isn’t over at all the alarmists sites, telling them to tone it down, or correcting their math. John Bell wrote something about "faking graphs". I've no idea what he was talking about. Once you are faking graphs it is no longer about truth, but power, money and control. Mr. Owain Glyndwr was probably sarcastic. April 9, 2018 at 1:05 pm@Curious – LOL@you. Progressives don’t have the sense of humor to even be sarcastic. Not to mention getting the cliche wrong. “Means justify the ends” just confirms his ignorance. Crispin in Waterloo but really in Potchefstroom is undoubtedly wrong. I'll bet that "Owain Glyndŵr" as a dyed in the wool, real live denier, is revelling in the fact he or she got a whole article at WUWT. Oh my, oh my, oh my! They are going to regret that tweet. Now we have the triple travesties of hidden declines, redefined peer review and faked temperature charts (as if Gavin proffering an annual global temperature record of 0.001 degrees with 38% confidence wasn’t fake enough). The CO2 concentration is shooting up. The temperature isn’t. If your bread and butter is claiming they rise together, I guess the only destination left is the corner of Crap-Data Crescent and Libel Lane. Perhaps we should expect Anthony to repudiate every incorrect or dubious comment that appears on his blog? 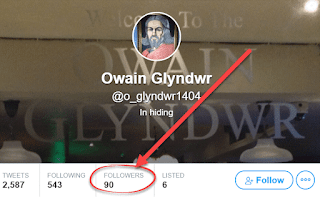 Owain Glyndwr is a sock puppet named after a figure from Welsh history. Young Anthony should be condemning him as an "anonymous coward" according to his previous posts. One thing baffles me: can anybody think of any argument from climate change deniers that has not been thoroughly debunked (and/or ridiculed as appropriate)? >>>> Perhaps we should expect Anthony to repudiate every incorrect or dubious comment that appears on his blog? Not just his blog - Anthony Watts should police ALL blogs. It's the only way we can be sure that what we read on the internet is true. Could someone make a reply to a tweet of Anthony Watts and write something that is true? Then we can make a HotWhopper post in three days asking why Watts did not reply. I'm on it Victor, although I'm not a native twitter user, I do have 63k followers. It appears I'm blocked? I can’t tell, here is my response with the retweet that wasn't posted? "Perhaps we should expect Anthony to repudiate every incorrect or dubious comment that appears on his blog"
He seems to have a wild talent for missing the ones that directly contradict his life's work . Why are you retweeting a dead person ? That made me laugh . Griff is one of the most common names in the climate wars for some totally unknown reason. This usurper is the forth one I know of. To me it looks like somebody who is trying to polarise the debate, dividing society. Sad that we will never know whether its some numpty fired up by watching too much Fox & Friends, or one of Eric's mates in Tomsk or St Petersburg who gets his sock puppets from Wikipedia. "Meanwhile back in the lab the science goes on. The sideshow of public debates entertain the masses, but they do not change the science. Year and year out, old skeptics die. And none leave behind any body of work that can be built upon. None offers an alternative theory, by design in fact. By design they do not offer testable alternative accounts of the climate. Like 911 Truthers who point to gaps in evidence, the skeptics have one goal. Create doubt about the best explanation. Their goal is not understanding. This in part explains why skeptics never question their own doubt. Doubt, not the reasoned understanding of uncertainty, is their product. Folks will have a debate. Science won’t watch. Science doesn’t care. Science only pays attention to the better explanation, and doubt explains nothing. Year and year out, old skeptics die. They leave behind no science for others to build on or improve; they mentor no graduate students; they teach no classes; they publish no papers, no data, no code. Oh ya, they post on blogs. Nature bats last, and the only defense you have against her as a scientist is to leave behind a better understanding of the world. Doubt aint a legacy, it’s a temporary tactic employed in the service of better understanding. Rather than posting over unders on Mann being a dunce ( he will be) we should do over/unders on prominent skeptics not croaking in the next 10 years and leaving behind nothing." Comment by Stephen Mosher at WUWT on the 'Climate Showdown' thread discussing upcoming debate featuring Dr Mann. Hope all is well with you and yours, Sou. And thanks for your good wishes. All is well and getting better. Hope to be blogging at full strength again very soon.